1. Who was the player of the decade in football? 3. Who was the best small school prospect in NFL draft history? 4. 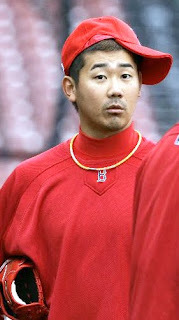 In 73 games over three seasons, Matsuzaka is 37-21 with a 4.00 ERA. Was Boston wrong in signing him? 5, If you were the Phily Eagles, would you trade Donvan McNabb or Kevin Kolb? 5. McNabb - he's older and more expendable. 4. Considering how much he cost them, yes they were wrong. 1. Gotta be Manning. May throw Brady, Champ Bailey and Ray Lewis into the mix as well. But no one is so singularly dominate in a game. 2. Def. Albert. A-Rod is a solid second. 3. Jerry Rice, though Payton was a great call. 4. I think he is a quality starter when healthy, though they did spend an awful lot for him. 5. I'd trade McNabb. You can get more for him, and Kolb is younger.